Kevin Grevey of the Washington Bullets shoots over former Kentucky teammate Rick Robey of the Boston Celtics. 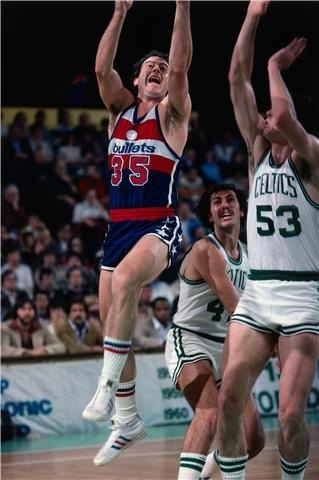 Before the Redskins won their first Super Bowl, and before Maryland and Georgetown won national championships in college basketball, the Washington Bullets gave D.C. its first championship in 36 years when they won the NBA title in 1978. Before the blue and bronze of the Washington Wizards, there was the red, white, and blue of the Washington Bullets. Local musician Nils Lofgren wrote a hit song, “Bullets Fever,” that was played over and over during the spring of 1978 on Washington radio stations. The name Bullets was synonymous with winning, as they made the playoffs 18 times in 20 seasons in the ’70s and ’80s. For the rest of my article on Examiner.com, click here for Part 1 and here for Part 2. This entry was posted on May 13, 2010 at 10:24 am and is filed under Examiner.com, Lakers-Celtics, Michael, Magic, Larry, and Dr. J, NBA, Washington Wizards. You can follow any responses to this entry through the RSS 2.0 feed. Responses are currently closed, but you can trackback from your own site.